Ebook piracy aided by Google? 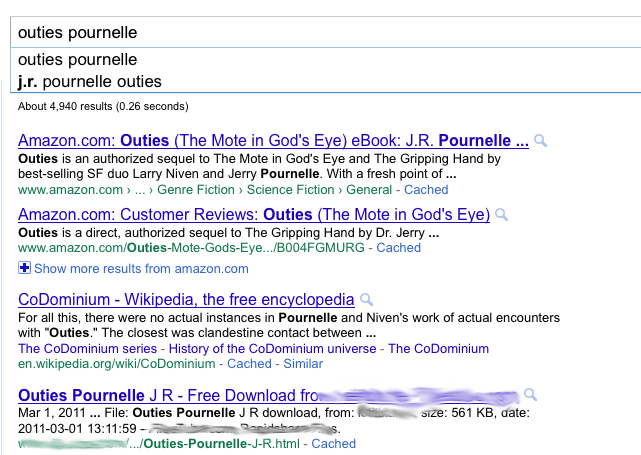 As most of you know, my daughter, Dr. Jennifer Pournelle, wrote a novel, Outies, set in the universe of The Mote in God’s Eye. It has been selling well, but the sales suddenly dropped. It happened so quickly that Jenny looked for reasons, and found that the event closely followed the appearance of pirate editions. Google was listing the pirate copies above the authorized copies. This is a serious matter. As Jenny says, she doesn’t mind if people give a copy to a friend, or make copies so that multiple people can read a legitimately purchased copy, but they ought to have a chance to buy a copy instead of having Google present them with pirate sites above the Amazon sites. She has cut the price of the book. The new price is not yet reflected in the Google summary, but it is correct at Amazon. The book has also moved up in the Amazon sales lists. Alas, the Kindle edition of The Mote in God’s Eye is not yet posted. I think they are supposed to be working on getting an Amazon copy out. I’m trying to get people moving on this, and I’m trying to get some of my older works onto Kindle. Now, I get that Google is run by algorithms, not by humans, but this looks like one of those that should somehow be put into place. I don’t pretend to know how. However, Google has already shown that it is, shall we say, not as interested in the copyright rights of authors as they could be. I’m as much for fair use as the next guy. I draw the line at freely downloading copyrighted books, though! That’s not fair use in anybody’s interpretation – it’s just theft! Baen Books has had a longstanding policy of not using any kind of digital rights management (copy protection) on their ebooks. 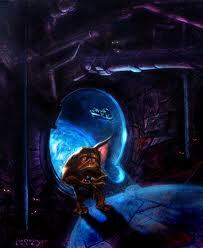 Jim Baen believed it actually helped his business. So does Cory Doctorow, who puts his books on his web site as free downloads at the same time as they appear in print. I don’t know how good a business model that is. I heard Cory talk about it live, last year, and he is still pretty adamant that it’s a good thing. Jim Baen has passed but the policy continues at his company. Still, an author or publisher should have the choice – not have his or her work stolen from them. This ain’t rocket science, people. Luckily, Jerry is a big enough fish that apparently the folks at Google heard about it and somehow fixed it. Most authors of ebooks don’t have that kind of clout. Frankly, I’m surprised Jerry does – not that he shouldn’t, just that Google would listen and respond. Oh, and go buy Outies. And if you haven’t, buy the other Mote books of Niven and Pournelle and read them first. Details are in my review.